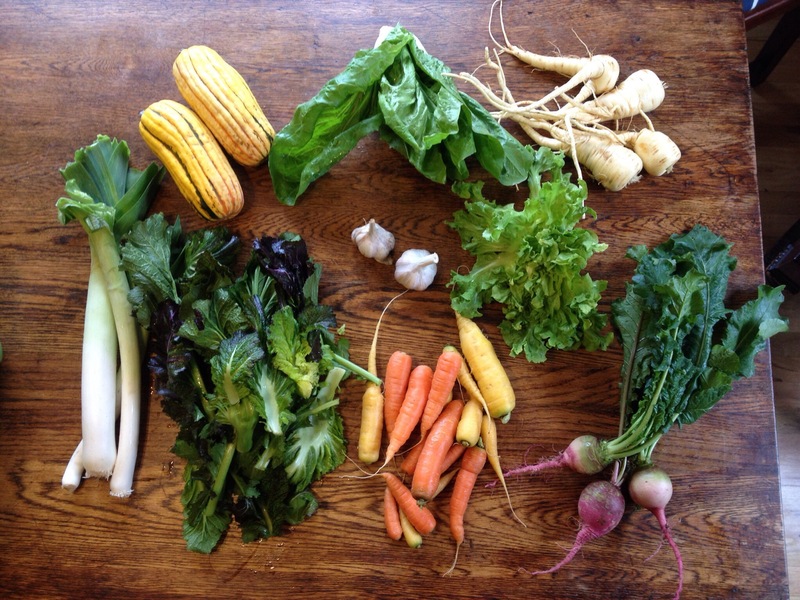 leeks, mustard greens, watermelon radishes (with edible greens), yellow & orange carrots, garlic, escarole, sugarloaf chicory, parsnips, delicata winter squash. I would suggest drying things off before storing them, as everything will store better if not too wet, especially the mustard greens. The garlic too may have gotten a bit wet from everything else in the bin so drying this out quickly and then storing at room temperature is best. The squash will store for Thanksgiving if you want, as will most of the other items that aren’t greens. The new chicory “Sugarloaf” (aka “pan di zucchero”) is similar to escarole in that it’s a bitter salad green which benefits from a good soaking in cold water. I would chop it up with the escarole and soak/wash them both together and then make a salad with olive oil and lemon or lime dressing. Check out the last post for some more info on the mustards and radishes. This share would be great for a root roast. You could peel if you want, and then chop the carrots, parsnips, and radishes into bite sized pieces, then toss with olive oil, salt and pepper, and roast in the oven at 350 until everything is nice and tender – maybe 30-50 minutes depending on the size you cut them. You could roast the delicata in another pan while you’re at it, too.